Synopsis: In the not-so-distant future, a worldwide epidemic of organ failures devastates the planet. Out of the tragedy, a savior emerges: Geneco, a biotech company that offers organ transplants….for a price. 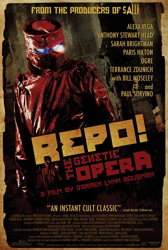 Those who miss their payments are scheduled for repossession…and hunted by the Repo man. A goth-industrial musical about a dystopian future where everyone is so obsessed with genetic modification for esthetic purposes that crime and addiction become common place side-effects. It’s low-budget, but well-made for such a film (although it could benefit from a larger budget oO), and it has a surprisingly good cast. But suspension of disbelief is required to enjoy bits of the plot. It’s also fairly kitchy at times. It’s, at best, a cult film. It’s certainly not for the average film-goer. But with the right crowd (perhaps the Rocky Horror kind? ), it might be a hit.